Mrs. Chehreh Goodwin, born in Persia, studied Art & Design in Durham and Surrey. Chehreh held her first public exhibition in the Middle-East in 1985. At a show in The Albert Halls in Stirling, Chehreh won a “Highly Commended” award for her painting “Flower Lady”. Chehreh’s work has been shown at His Majesty’s Theatre in Aberdeen, at the Gordon Forum for the Arts exhibition in Inverurie, The Heritage Centre in Alford and the Art Centre in Monymusk. Chehreh has also had her work shown internationally in Qatar and Azerbaijan. 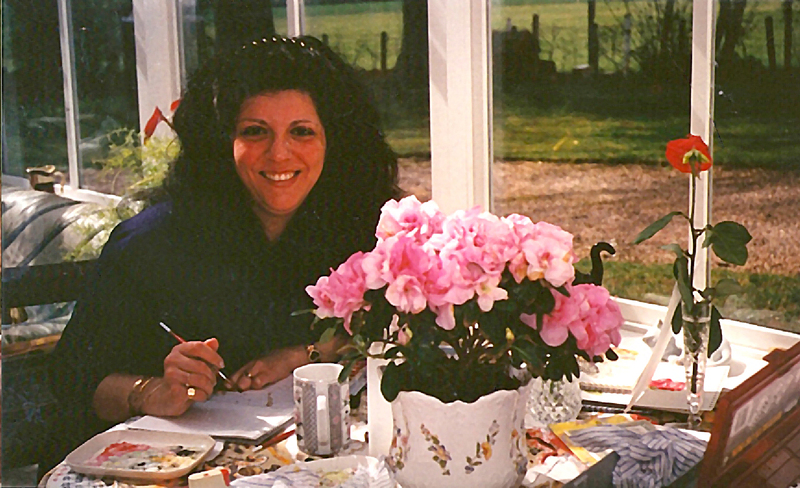 Chehreh has taught art to adults since 1986, both privately, and in Community Centres in Cults, Westhill, Dyce and Alford. Chehreh specialises in water colours employing a wide range of innovative techniques, uniting Eastern and Western styles. Her pictures are painted both for her own enjoyment and commission. She currently lives with her husband in the friendly village of Inverurie. The aim of the Painting for Pleasure classes is to help both people who want to start to draw and paint and those who want to improve. The aim is also to have fun. This is achieved using a number of exciting projects, each of which take about a year to complete, and in which students learn how to use many different techniques and media. The projects use the techniques being taught and help each person develop and refine their own style. The results will be a folder of drawings and paintings that will use most of these techniques and media but will be unique to each student. · All the media together and using as many different textures and techniques as possible. 1. Basic drawing and painting techniques with water based mixed media. 2. Learn how to draw and paint flowers, fruits and vegetables. 3. Learn how to draw and paint birds and animals. 4. Learn how to draw and paint marine life. 5. Learn how to draw and paint portraits. 6. Learn how to use perspective.